As 2010 came to a close I found myself looking forward to the New Year for so many reasons but one, I must admit, was our New Year’s Day meal. Pork and sauerkraut is supposed to bring luck – a tradition of German roots and a meal started by my Mom’s Mom – in the new year and seeing how we certainly weren’t about to take any chances this year, we gathered the family, bought a roast and plenty of kraut, and toasted the year ahead. Giving credit where credit is due, I must confess that my Mom and Aunt did most of the preparing of this meal, as I’ve been nursing a nasty cold– cough, cough – but I was there to photograph and of course, help eat the finished product. First, the ‘kraut. One day I may find myself with enough time on my hands to make my own kraut, but for now I’ve found that prepared sauerkraut works just fine. 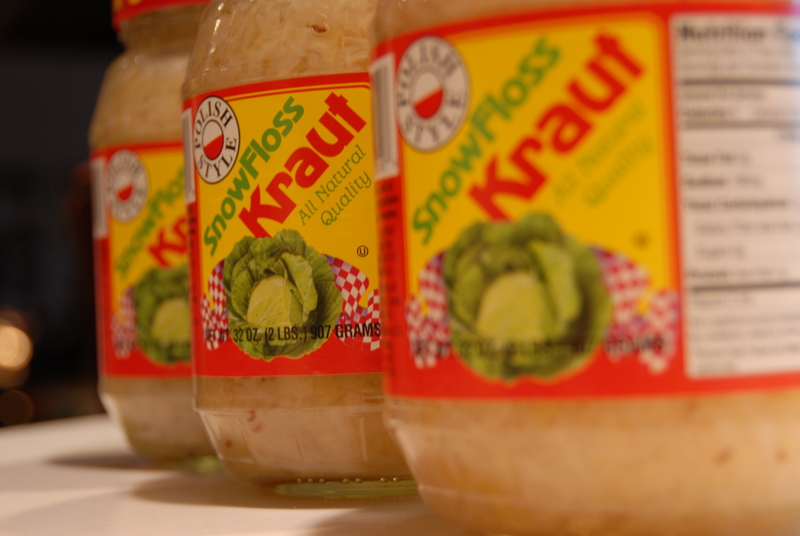 Traditionally we use sauerkraut that’s been prepared with caraway seeds– for that extra punch of flavor. Second, the pork. A center cut pork loin and baby back ribs are our cuts of choice for this dish but by all means feel free to improvise. Start with putting the sauerkraut at the bottom of your roasting pan (we used 4-5 jars) along with about a cup of water. 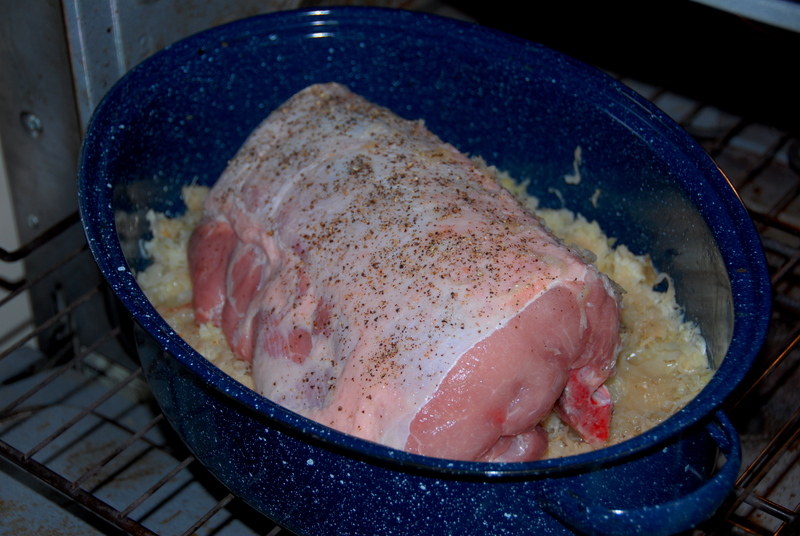 Next, place the pork loin, seasoned with salt and pepper, in the center of the pan. With the roasting pan’s lid off, brown the meat in a hot oven – 400° – for about a half hour. After it has a nice little crust on it, take the heat down to 325°, place the ribs around the loin, place the lid on the roaster and continue to cook for about an hour and a half (this time was sufficient for our 6lb loin). Back when Grandma was makin’ it Betty Crocker suggested pork to be cooked to a temperature of 170° but now the magic number is 160°. After about an hour of cooking you may want to check the temperature periodically to be sure not to overcook it. Allow the meat to rest for a good 10 minutes before serving. 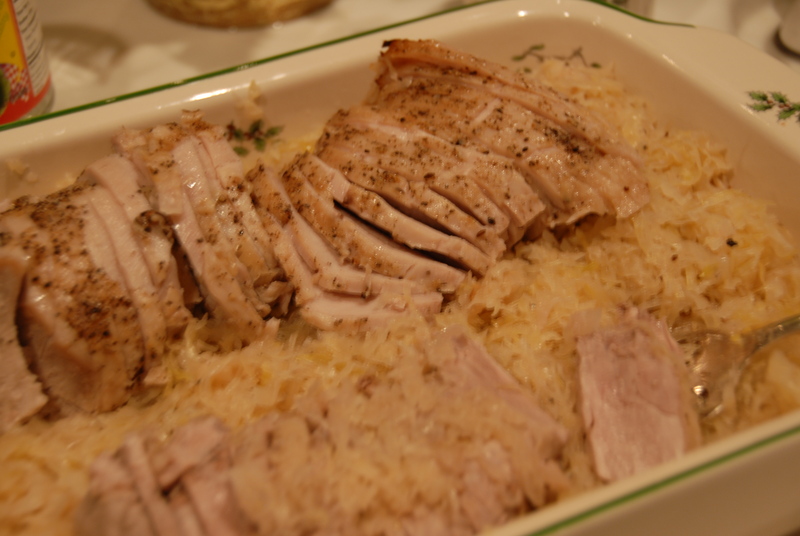 Yumm…The pork is juicy and tender from being cooked along side the sauerkraut and the kraut’s tartness is mellowed just enough while still maintaining its signature tang. We round out the meal with Yukon gold mashed potatoes, buttered peas and carrots, baked apples and applesauce. A relatively simple meal but one that always leaves you satisfied (and hopefully, full of luck). This is a wonderful winter meal and it gets even better days later as leftovers. Seeing that I’ve had my fill of food and drink (for at least a few days) I cheers you all with a mug of hot lemon water and say – here’s to 2011, may it be a spectacularly delicious year. This entry was posted in Pork, Sauerkraut and tagged apple sauce, baby back ribs, carrots, cheers, good luck, mashed potatoes, new year, peas, pork, pork loin, roast, sauerkraut. Bookmark the permalink.